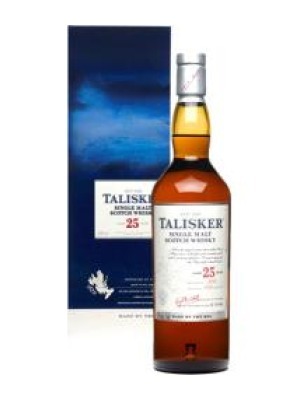 Talisker 25 yo Island Single Malt Scotch Whisky is a popular Whisky available from TheDrinkShop in 70cl to buy online. Visit TheDrinkShop for the best price for 70cl of Talisker 25 yo Island Single Malt Scotch Whisky or compare prices on our other Whisky products. 2011 Bottling. More subtle and teasing. Not as much a knock-out punch on the finish like the Talisker 10 and 18, but rather more steady intense blows to the abdomen for many rounds. An ageing Talisker, but still with many redeeming qualities. It is drier than its younger siblings, with less fruit and more of a stony texture, with dried spices and lingering leather notes. This whisky requires more patience and demands more concentration, but it is still rewarding to the seasoned aficionado (with some extra pocket change). Where to buy Talisker 25 yo Island Single Malt Scotch Whisky ? Talisker 25 yo Island Single Malt Scotch Whisky Supermarkets & Stockists. You can buy Talisker 25 yo Island Single Malt Scotch Whisky online in most retailers and find it in the Whisky aisle in supermarkets but we found the best deals online for Talisker 25 yo Island Single Malt Scotch Whisky in TheDrinkShop, DrinkSupermarket.com, and others. Compare the current price of Talisker 25 yo Island Single Malt Scotch Whisky in 70cl size in the table of offers below. Simply click on the button to order Talisker 25 yo Island Single Malt Scotch Whisky online now.